Eastern Caravan Group (from l. to r.) Ozan Cemali, Diederik van Wassenaer, Shahyar Daneshgar and Behrouz Farrokhi. 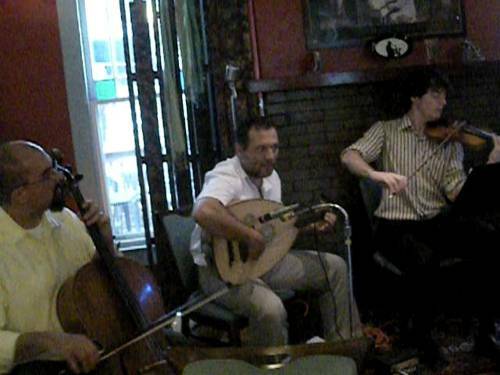 The group consisted of Shahyar Daneshgar on guitar, percussion, vocals; Ozan Cemali on oud, baglama, vocals; Diederik van Wassenaer on violin, and Behrouz Farrokhi on percussion and vocals. 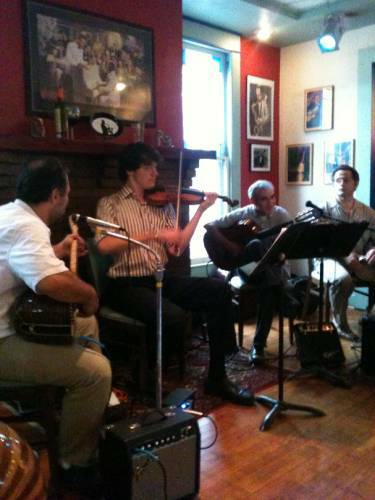 Most of the music was from Azerbaijan or Turkey with a scattering of tunes from the Middle East and Western Asia. Almost none of which I’d heard before. I don’t often get the opportunity to do things like this–usually I’ll sit in playing percussion or various groups since I have a relatively healthy knowledge of the rhythmic patterns, fills, and modes for a wide variety of music. With the exception of Diederik, I’ve never played with any of the others before–never heard them play either, for that matter. Diederik, as some of you who follow this blog may know, is the violinist in my Balkan ban, Kermes. Wonderfully talented violinist in the School of music at IU. I did try to return to my table on a couple of occasions early on after feeling like I was just indulging in playing at my own whim, but Shahyar Müellim would have none of it as he constantly motioned for me to rejoin them and for that I am more than grateful. 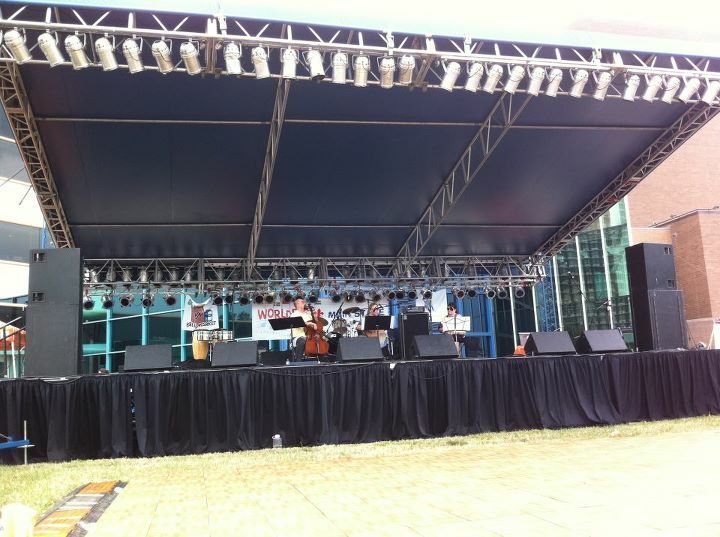 Earlier yesterday I got to perform with my Arabic band, Ahel El Nagam, at Louisville WorldFest in Louisville. This is probably the biggest performance we’ve had (or at least that I’ve done with them)–probably several hundred people in the vicinity of the main stage we were playing (there are three stages at WorldFest if I recall correctly). Fortunately we had an early enough set at WorldFest that I could leave immediately afterwards and make the two hour drive to Bloomington for the evening show. I actually ended up getting at the venue before everyone else did and we didn’t start till 7pm despite the start time stated by the event invites on facebook. So all was well. With Ahel El Nagam, we’ve managed to find copious amounts of sheet music that we use for our arrangements. With the exception of a few tunes, I have most of this music memorized so can focus a bit more on ornaments and some fills. There are also occasionally opportunities for metered improvisations, but with some of the Classical Egyptian music, the taqsims tend to be written out which presents a different kind of issue when trying to present what would otherwise be an improvisatory section as improvised when it is, in fact, written out. There are different ways of dealing with this, but that may have to wait for a series of blogs dealing with improvisation, which I’ve not really written about much despite having spent nearly twenty years improvising in some form or other. I think there are so many interesting issues related to the art of playing without music–so many issues that deal with overlapping and intersecting musical skills and I should blog more about those things especially as it relates to an efficient way of using those skills without having to create disparate and unrelated skill-sets, which can happen if these skills become to compartmentalized (i.e. placed into boxes, since some of my latest themes have dealt with getting outside of boxes). Overall, though, it was an enjoyable day of playing non-Western pop or classical music which has become ridiculously easy to do in this day and age where Western musical hegemony is no longer (no that it ever really was as I’ve been pointing out in this blog) the dominant musical culture in the US. Next What happened to the composers, anyway?